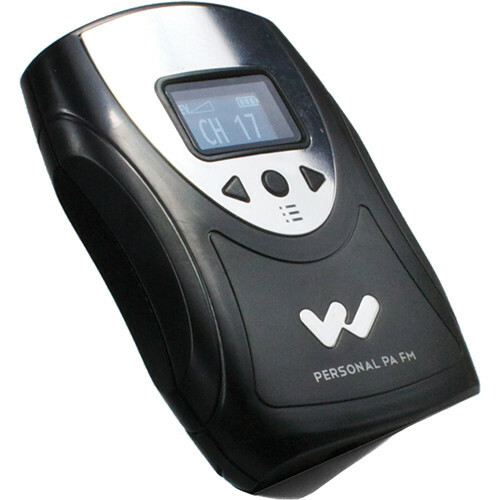 The Williams Sound FM R38 includes a PPA R38N receiver with a belt clip, an EAR 022 surround earphone, and a pack of two AA batteries to power the unit. Compatible with all Williams Sound 72-76 MHz wideband transmitters, the receiver features a high-resolution OLED screen for on-screen channel selection and is designed to provide audio clarity and stability to help individuals with mild hearing loss overcome distance from the sound source. The Williams Sound PPA SelectView FM Receiver is an FM receiver for assisted listening applications. It features a high-resolution OLED screen that provides a quick view of receiver status and immediate entry to all user settings. The receiver has on-screen channel selection with access to 17 pre-set, wideband frequencies (72 to 76 MHz). The PPA SelectView is digitally synthesized to provide audio clarity and stability and also features digital tuning, digital squelch and battery-saving sleep mode. A belt clip is included. All user settings are accessible via the on-screen menu - including all 17 wideband channels. This Williams Sound AA Alkaline Battery 2-pack is compatible with several FM listening systems, receivers, transmitters, earphones, headphones, and more. Box Dimensions (LxWxH) 3.858 x 2.52 x 1.181"
Box Dimensions (LxWxH) 1.9 x 1.0 x 0.5"